General Motors is working on developing an electric car that has as much as 200 miles (320 kilometers) range, Chief Executive Officer Dan Akerson said. Dan Akerson also told a meeting of energy executives and investors that GM's new Spark EV would have a range of 75 miles to 80 miles (120-129 km) on a single charge - double the electric-only range of its Chevrolet Volt plug-in hybrid. The Spark is due to go on sale this summer. The CEO saw the Spark as an urban car because of consumer concerns about what many in the industry call range anxiety. 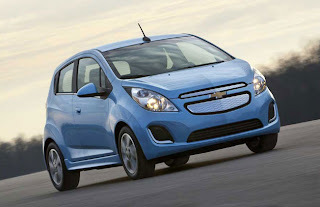 GM has touted the Volt for its electric driving range of 40 miles that is then augmented by a gasoline engine. Akerson went on to describe a giant inductive pad under development, which can sit in a garage and charge a homeowner's vehicle every night. Inductive charging technology has not been rolled into any GM products, but the company did invest $5 million in wireless charging start-up Powermat in 2011. Improving battery life is a priority for many. LG Chem said in October a new generation of power packs would debut in 2015 with GM. So tesla will have another 2-3 years with no competition from GM?